Ashley Paxton serves as the director of marketing with the Las Vegas Aviators. While conversations regarding diversity and inclusion happen daily in the Minor League Baseball office and among our 160 clubs, we recognize the need to do more to elevate the voices and stories of those who currently work in our industry. There is something uniquely powerful about sitting face-to-face with someone and listening to his or her experience. The goal of this series is to spotlight the people, programs and stories in the baseball industry that champion diversity and inclusion and advance the mission of Minor League Baseball's diversity initiative. In recognition of Women's History Month, every week in March, we will profile a female leader in our industry. This week we profiled the Las Vegas Aviators director of marketing Ashley Paxton. Finding success in baseball requires passion and dedication, and Ashley Paxton has embodied those characteristics. The Las Vegas Aviators' director of marketing is entering her first full season in her new role after spending the last three years leading the team's social media and branding efforts. As the granddaughter of a former umpire in the Puerto Rican league, Paxton grew up around the game of baseball and working in the industry was always her aspiration. "I've always believed in hard work and learning how to market yourself, especially in the competitive world of sports," said Paxton. My motivation has always been that dream I've held on to: to work in baseball." A lifelong baseball enthusiast, Paxton incorporated the game into her wedding with her baseball toss bouquet. 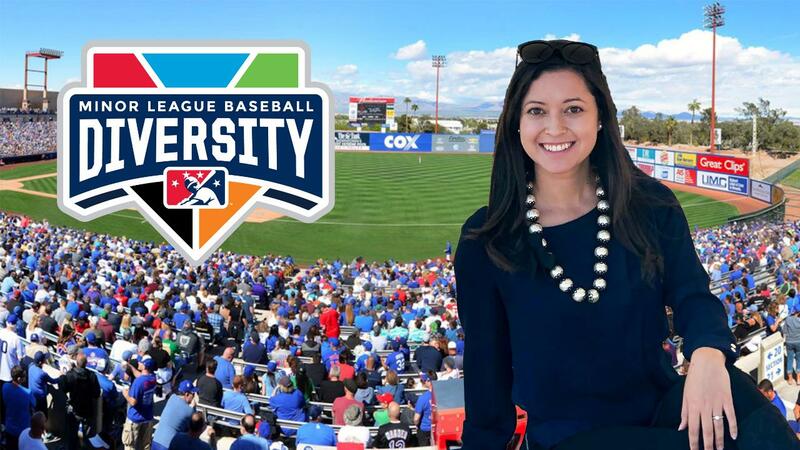 As a young Latina working in sports, Paxton has been an advocate for Minor League Baseball's diversity and inclusion efforts. She credits her upbringing and the women who raised her for instilling the values that guide her day-to-day interactions with colleagues and fans. "I am very fortunate to have come from a family of strong women who grew up around the game of baseball in New York and Puerto Rico. I strongly believe and advocate for diversity and inclusion within the workplace. The more diverse our teams are, the stronger we are. I strive to create a sense of belonging and value in the opinions of our fans and employees. I want all fans to feel welcomed and at home in our ballpark." In 2018, Minor League Baseball successfully expanded its Copa de la Diversión ("Copa") program - a season-long event that embraces the culture of the Latinx population within participating teams' local communities. In 2017, the Aviators were one of four pilot teams selected to test the viability of the platform. Paxton saw it as an opportunity to breathe life into what quickly became a passion project. "Being one of the pilot teams, I wanted Los Reyes de Plata ("Silver Kings") to lead with its best foot forward. It not only required me to do my own research, but I also had to expand my network of local professionals within the Latinx community here in Las Vegas. As a Puerto Rican, I was thrilled to be a part of this initiative. I haven't had to write anything in Spanish in a long time, and being a part of this project has allowed me to tap back into my Hispanic roots to help bring our Copa identity to life." Corey Silva (left), Ashley Paxton (middle) and Heather Henderson (right) at the Aviators and A's affiliation press conference. Leading the Aviators' marketing efforts has been a perfect marriage of Paxton's passion and professionalism. Outside of her work with the team, she also finds purpose in connecting with and encouraging young women who, like her, dream of a career in baseball. "My proudest moment working in MiLB was serving as a table moderator and host at the Women in Baseball Leadership Event at the 2018 Baseball Winter Meetings. As part of the very first Women in Baseball panel for job seekers, I was honored to empower my colleagues and budding sports professionals by driving the conversation about women in baseball. Empowering and mentoring young women and young professionals in general has always been important to me." Paxton brings a strong work ethic and pursuit of excellence to the workplace, and that ambition has paid off early in her career. She doesn't let early wins keep her complacent, though, and she continues to dream big with regard to her future in the industry. "I have fallen head over heels for Minor League Baseball. One day I hope to be the female [Minor League Baseball President & CEO] Pat O'Conner. In the short-term, though, I hope to lead our organization into a contained campaign of community-driven marketing and help cement the Aviators as a welcoming environment for all." Ashley Paxton is trailblazing a path of her own that is filled with enthusiasm for building marketing campaigns that resonate with fans of all backgrounds and creating an atmosphere of inclusion that transcends the ballpark. With her creative approach to marketing and her understanding of the importance of connecting with others, there is no dream too big for her to achieve. Benjamin Pereira is an associate with Minor League Baseball. This story was not subject to the approval of the National Association of Professional Baseball Leagues or its clubs.